Another southern plains moderate risk day that yielded less than expected. Supercells yes, but since they were moving along a frontal boundary instead of developing on a dry line, they tended toward high precipitation and hence the tornadoes produced were not easily visible. Significant cloud cover throughout the day kept instability lower than forecast and in addition there was a slight veer-back-veer in the upper wind profile, both of which contributed to storm outflow quickly undercutting inflow as tornadoes tried to establish themselves. The result: those that developed were mostly brief, lasting only a few minutes. Walt, Eric and Gene left Cordell, OK shortly after 1:00 pm CDT initially to check out the position of the frontal boundary laying SW to NE across the body of the state and to take a look at storms developing on the cool side of that boundary. We found the frontal boundary along US 183 between Rocky and Hobart, its position made obvious by the sudden condensation on the car windows when we crossed it. Not long after a tornado watch was issued and we elected to continue on toward Synder or points south of there. While on the way, an elevated supercell developed above the cooler air behind the front near Roosevelt and was quickly severe-warned. At the same time a warm-sector storm was organizing in the Vernon, TX area just S of the Red River so we continued on to Frederick and Davidson, eventually positioning on CR 2150 in Tillman County to wait on it. 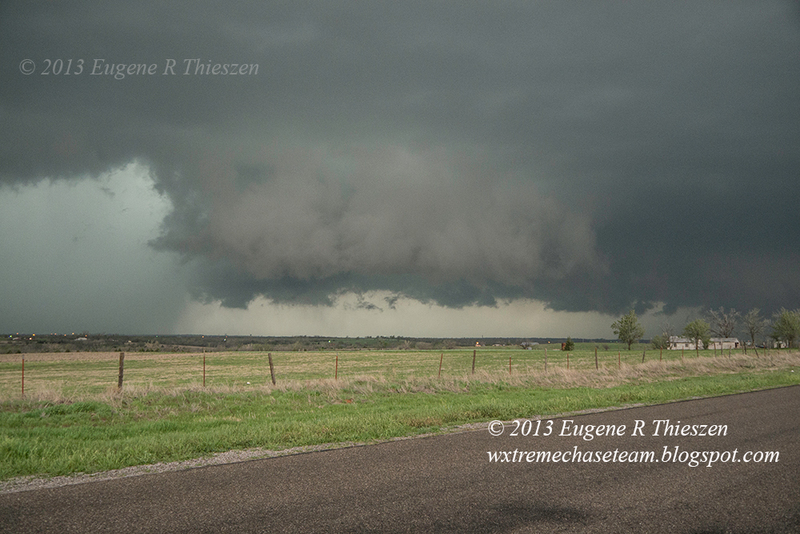 Jason was about 30 minutes behind the rest of the team and met the storm as it approached US 183 near Frederick. 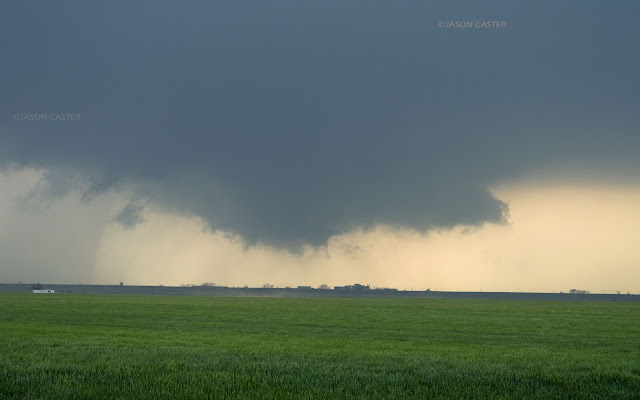 The storm developed a rather large, very low-hanging wall-cloud as it became severe warned, but only was able manage a few transient, ragged funnel-clouds. The full team met up between Davidson and Frederick and after a quick fuel stop we headed E with the storm on SR 5. A second storm developed a ways W of US 183 and we nearly abandoned our storm to intercept it, but just as we made the decision to do so, our storm went tornado warned. So we continued with it along a variety of graveled farm roads making our way NE. 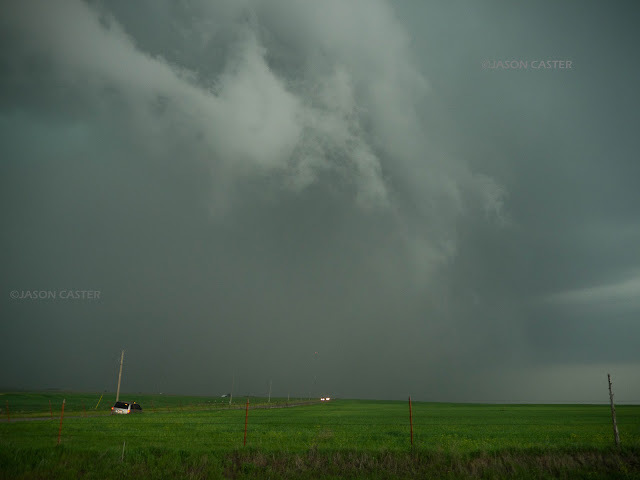 The wall cloud was often wrapped up in rain and so it was not at all easy to see what was going on as we passed through Chattanooga and eventually to the intersection of SW Mission Deyo and SW Coombs Rd west-southwest of Lawton. As we proceeded E on SW Coombs Rd a tornado was reported by spotters 11 miles W of Lawton Airport -about 4 miles W of our position. After a bit we saw a cone come out of the rain, but it did not last long. By the time we were able to find a pull off point to attempt some photographs, it had disintegrated. The entire mesocyclone disappeared in the rain and we continued E toward the airport and negotiated our way around it and I-44 and continued to parallel the storm on SR 7. Reaching SR 65 we headed N toward Sterling and witnessed a couple brief tornadoes, again while on the road. One was easily visible as we came up on a hedge of trees and by the time we passed the hedge and pulled off it was gone. Frustrating for photographers! We set up just over a mile S of Sterling and observed the storm as it closed in on our position. Again a substantial, low-hanging wall cloud, but no further tornadoes. At this point we left this storm behind and elected to retrace our steps back toward the second tornado-warned cell approaching Lawton. As we neared the city, there were several reports of tornado touchdowns, but the heavy precipitation obscured our view. Once in Lawton, we witnessed a number of power-flashes as we turned off of Lee Blvd to head N on Sheridan Rd at around 7:00 pm The circulation passed in front of us by several miles, but we witnessed no further power flashes. Now in downtown Lawton, we elected to head toward a third severe storm which was W of Cache but by the time we approached it, significant weakening had occurred. A new supercell was organizing on the warm front/dryline intersection near Vernon, TX and looked good on radar, but a quick calculation indicated we would not be able to reach it before dark. Chase's end! Tornadoes: 2 or 3 brief touchdowns; power flashes in Lawton. You got some great photo's even though the set up wasn't what everyone hoped for. I always enjoy the photo's and the video's.